Great suit or tuxedo for any occasion. 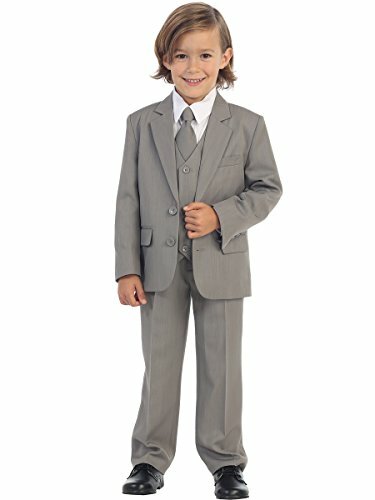 5-Piece formal boy's suit includes jacket, pants, vest, shirt and tie. 2-Button 3-pocket lined jacket with pleated front and elastic back pants (very helpful for growing boys). Button up fully lined vest with full back. Available in black, khaki, light gray, ivory, and white. Pre-formed zip up tie matches the suit color. White button down dress shirt. Ivory button down dress shirt with ivory suit. Pointed collar and barrel cuffs with adjustable cuff width. Suit: 100 % Polyester - Dress Shirt: 65% Polyester/35% Cotton. 5-Piece Formal Boy's Suit includes Jacket, Pants, Vest, Shirt, Tie. Great suit or tuxedo for any occasion. Two Button, Three Pocket, Fully Lined Jacket. Full-Back Three Buttoned Vest. Pre-Formed Zip Up Tie Matches Suit Color. Suits Include a Basic White Button-Down Pointed Collar, Barrel Cuff Dress Shirt [Ivory Suit includes: Ivory Dress Shirt]. Available in Black, Khaki, Light Gray, Ivory, and White. Sizes: Toddler Small through boys 20.